Customers today want to communicate instantly on any medium. They expect real-time contact, whether that’s by phone, video call, text message or live chat. If you can’t offer this, you’re probably losing business. And then there are compliance requirements such as GDPR & MiFID II to consider. Offer these communications without compliant recording and you risk major fines and reputation damage. 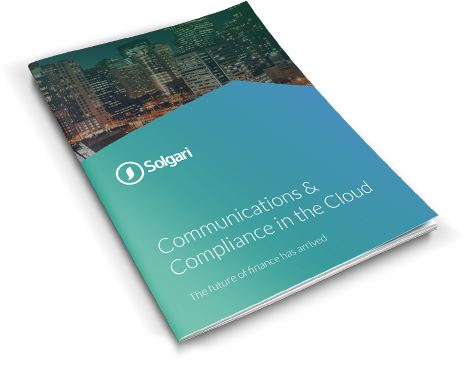 Solgari customers in 33 countries are winning this digital race by running all communication channels, integrated and automatically compliant, on our cloud software platform. Real-time communications integrated across all channels – voice, WebRTC video, SMS, Instant Messaging and Chat (including 3rd party chat apps). GDPR, PCI DSS & MiFID II compliant recording & archiving, military grade encryption. Easy to store, search, retrieve, and analyse. One integrated cloud solution, instant CRM connectivity, unlimited reporting and analysis. Full end to end communications and compliance, integrated in the cloud. Utilise all digital channels including voice, WebRTC video, chat and SMS. All digital channels and: IVR, queuing, skills based routing, barge-in and more. GDPR, PCI DSS and MiFID II compliance across all communications. Instant online video meetings, embed video conferencing, desktop and document sharing capabilities. A two-way messaging service ensures delivery and receipt through Communicator or CRM software. PCI DSS compliant payments, marketing surveys, multiple languages and more. Enjoy unlimited reporting for a customer specific, live view of business performance. Word and phrase searching within recordings, far faster & accurate, 26 languages. Integrates with any CRM with using Solgari Link. MS Dynamics 365, Salesforce, Zendesk & more. 100% accuracy for inbound customer call identification. Not just a software provider, Solgari carries the voice traffic, provides numbers anywhere. Start your 2-week trial now and get immediate access to integrated omni-channel communications, compliant recording & archiving, and more. The demand for omni-channel communications that can integrate successfully with Microsoft Dynamics 365 has become very clear as well as the need to think carefully about regulations such as MiFID II & GDPR. We partner with Solgari to meet these customer requirements. This latest innovation with the launch of Communicator and the ability to record all communications including SMS and chat fills a key need in the market.